As it turned out, our restful night at Karanga Camp was a bust. I tried to get some winks but found only a few. Some of this was due to attitude (trying harder when it comes to sleep never works). Some of it was due to the altitude medication (seriously, didn't you just pee ten minutes ago?). And some of it was due to the the wind (more on this below). 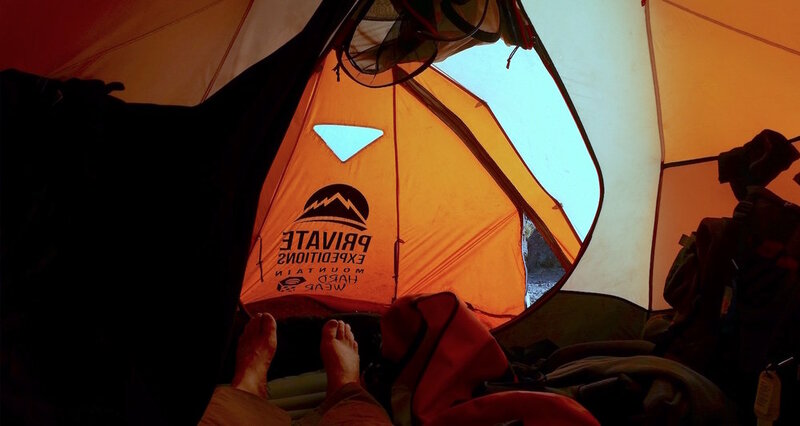 On top of attitude, altitude, and wind, my air mattress grew ever more uncooperative. It was one of those nice mattresses with a heat-reflective layer that is supposed to keep you snuggly warm even if you choose to bed down on an iceberg or glacier or such. It also shared many qualities with a Wham-O Slip-'n-slide. Since the tent was pitched on a decent slope and I was all trussed up in my slick nylon mummy bag, I spent much of the night imagining what goes through the mind of an inch-worm when he finds himself inadvertently on the windshield of a moving truck. And speaking of wind . . . It shrieked throughout the night. The tent shuddered, shook, and jumped. Fortunately, unlike me on the inside, it managed to grip the slope. The portable loo, however (containing our thunderbox), did not. A single tether was the only thing that kept it from kiting a brown streak all the way to Madagascar. I fretted about the possibility of the blast continuing. The plan was to strike out for the summit at midnight, less than 24 hours away. What happens if this wind does not let up? What if the temperature goes sub-zero? I fretted and inched my way back to the uphill end of my fluttering nylon world. At last, I pulled the plug and did without the cushion. Only then did I manage to hold my position and slip off into slumberland. In the morning I rose to a blessed stillness of wind and mind. "And then he (Harry) knew that there was where he was going." In "The Snows of Kilimanjaro" Ernest Hemingway described the square top of the mountain as"wide as all the world." The porters packed the camp. I was hesitant to inquire about the thunderbox situation and used the public latrine instead. I discovered that even though the public latrine didn't blow over in the night, it obviously had been subjected to a hurricane of a different order. 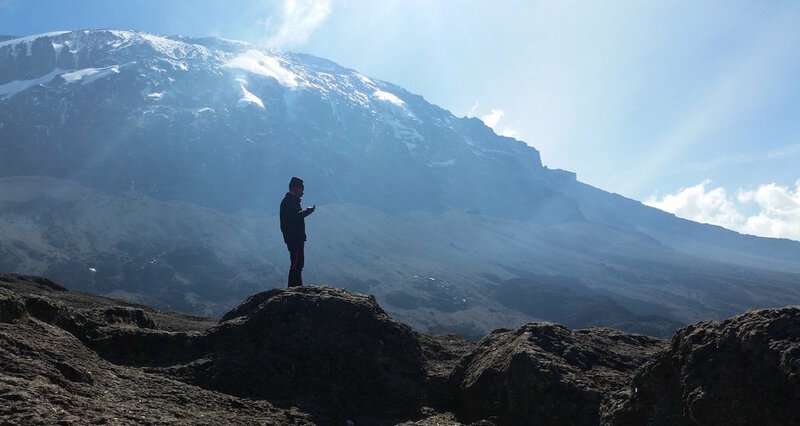 We did the necessaries: health-checks, coffee swallowing, etc., and set out for Barafu Hut. The trail from Karanga to Barafu Hut was short and relatively easy. We kept the dome of Kibo to our left and skirted its shoulders. The elevation gain put us back over the 15,000 foot mark. The pitch was initially steep. It calmed down but then became strenuous at the end. Switchbacks carried us up the last bit. The sound of our walking sticks striking the volcanic rock provided the rhythm. The trail to Barafu Hut. This ridge is the highway to the summit in the distance. Photograph by teammember Jason Wilcoxon. 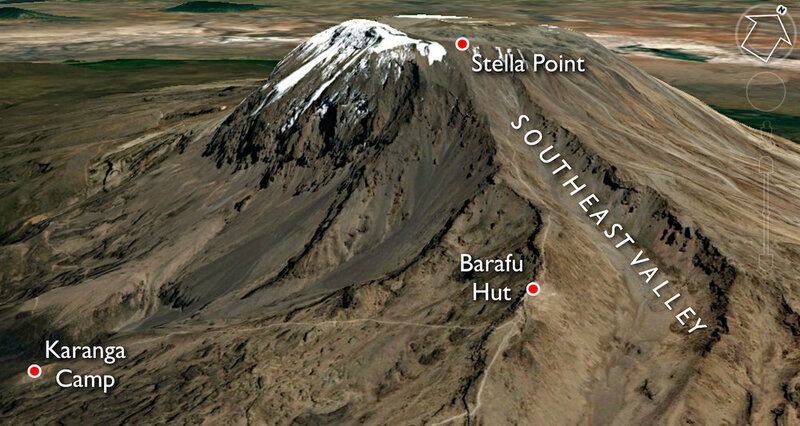 Barafu Hut was the oddest and most precarious camp on the mountain (that I experienced). It straddled a ridge littered with climbers and gear. As testimony to Tanzanian cooperation (go with me on this! ), teams squatted along this stairway to the clouds. On one narrow shelf was a cluster of green tents. Above them was a row of orange tents and so on. We walked between--and through--these clusters and rows, stepping over packs, sleeping bags, tarps, boulders, guy lines, and sleeping climbers. It was a maze. At the end, we found the ranger station and signed in. Then we found our porters on a slope that tumbled into the Southeast Valley. Barafu Hut is the last stop on the way to the top. Our feet were planted at 15,239 feet. From this narrow spine the summit attempt would be launched. The clouds returned. The mountain rose steeply from beneath us, transforming from brittle brown rock, to lumpy grey in the distance, and then into ethereal white. The most difficult part of the journey was now directly before us. Older PostO little town . . .